Dr. Stephan Sweet is board certified by the American Board of Orthopaedic Surgery. His positive and warm bedside manner is one of his strongest attributes. Customizing his approach to match each patient’s specific needs, Dr. Sweet has an excellent track record of patient satisfaction and proven successful results. 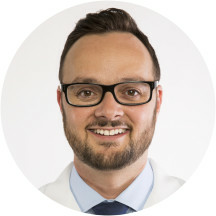 After earning his Master’s degree in public health from Columbia University and a Medical degree from Georgetown University, he completed his orthopedics surgery residency in Los Angeles at the University of Southern California. As he became proficient in treating a variety of orthopedic conditions throughout the body including bone fractures and arthritic joint conditions, Dr. Sweet also developed a special interest in sports medicine. He stayed in LA to expand on his sports-related orthopedic training and completed a fellowship at UCLA in sports medicine and arthroscopic surgery. Here Dr. Sweet gained expertise in shoulder replacement as well as some of the most innovative orthopedic techniques available to patients. These skills include treating shoulder, knee and hip conditions with minimally invasive arthroscopic procedures. His use of these state-of-the-art practices allows patients to return to their regular activities as quickly as possible. During his time at UCLA he was a team physician for several of the sports teams including football, water polo, tennis, and track. Dr. Sweet has an impressive educational background including Emory University and the University of Pennsylvania. He has also participated in award winning orthopedic research projects and been published in journals and a sports medicine text book. In his free time, he enjoys: movies, sports, exercising, travel and most of all spending time with his wife and young daughter. excellent staff and Doctor !! i would highly recommend it . I feel Dr. Sweet is very professional and feel confident he will help me. Donald C.
Dr. Sweet is great- very supportive and knowledgeable. Worh the wait. Grateful I went to Dr. Sweet for the issue with my shoulder. He was informative and descriptive in regards to my injury. Happy to say other than a couple little scars. Healed and no longer have the discomfort or pain Ihad over a year ago. Appreciate Dr. Sweet and his staff! Very personable and knowledgeable ! Great visit, doctor very thorough and detailed. Staff was friendly and warm. Front office was a little discombobulated. They mixed up my appointment and said it wasn't for 2 weeks, when I had email confirmation saying otherwise. Lady working desk seemed new, plus the office manager wasn't there who I had been correspondingwith, and had my completed forms. Anyway, someone with experience took matters over, and it finally got sorted out. The experience with Dr. Sweet was excellent. Friendly, good bedside manner, but also a straight-shooter, which i appreciate. I went in for intermittent wrist pain and for more preventative purposes. I would have appreciated a more direct conversation about what steps I could take now to prevent it from getting worse. I got a general recommendation to take Advil.The intention was to rely less on google and get a professional opinion for appropriate (or professionally discouraged) courses of action but the conversation was vague at best, so I'm left with Google. Regardless, this experience will not discourage me from going back if the pain increases. He was an attentative doctor. The staff and Dr. Sweet are kind, thorough, and friendly. Dr. Sweet and his staff were extremely professional and helpful. I needed to have x-rays in the office and it was done very quickly and efficiently. Dr. Sweet reviewed the MRI results that I brought in. He explained several optionsand possible procedures to repair my injury. Any questions that either my wife or I asked were answered. He took his time with the examination and discussing my symptoms. Then made his recommendations very clear and with a return date to review the test results he wanted done. I really appreciated how well he explained his findings in my X-ray and his initial treatment plan. I like that his plan is conservative treatment without any rush for surgery as a fix. Dr. Sweet was very professional and friendly. I felt that he really looked at me and my specific issue and had the expertise to render an opinion even if that did not involve his specialty. I thought Dr. Sweet was great. The wait was way too long. I came in 30 minutes early to finish the paper work and then waited an hour and a half before I was taken back. Good experience. The front office staff was pleasant. Back office staff were very good. Doctor was very good. Took time to listen to my concerns and provided intial diagnosis that was confrmed with in office x-ray. Discussed options and longterm prognosis. I am not happy with my body, but I am happy with the doctor visit. Highest praise in all areas. Dr. Sweet saw me right away and he listened to everything I had to say about what was wrong with my knee. He already had looked at all the paperwork I had sent him. It felt like he was up todate on my case. He offered a new idea and gave a new suggestion on what I could do for pain. I saw him yesterday and today I can honestly say that my pain is a little bit better. I feel better knowing that someone took the time to read over my case and then come in and be so amazing and caring when we were face to face. I am truely that I have met Dr. Sweet. !!!! !